ESXi 6.0 requires a little tweak to run without problems on an Intel NUC. This post explains how to create a customized ESXi 6 ISO for your 4th and 5th gen. Intel NUC. 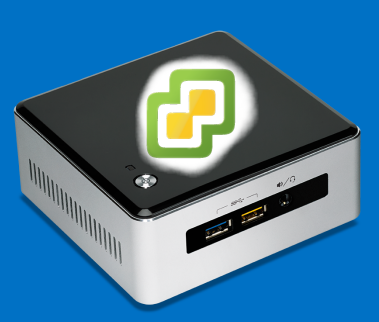 The images can be used to do a fresh install or upgrade a NUC to VMware ESXi 6.0. Download and install vSphere PowerCLI 6.0 to use the Image Builder. This requires an account at vmware.com. If you are not entitled to download PowerCLI, register for an evaluation. New-EsxImageProfile -CloneProfile "ESXi-6.0.0-2494585-standard" -name "ESXi-6.0.0-2494585-NUC" -Vendor "virten.net" -AcceptanceLevel "CommunitySupported"
Enter the following commands. The Image Profile used is currently (April 2015) the latest available. Check my Image Profiles Page to get the latest profile. New-EsxImageProfile -CloneProfile "ESXi-6.0.0-20150404001-standard" -name "ESXi-6.0.0-20150404001-NUC" -Vendor "virten.net" -AcceptanceLevel "CommunitySupported"
Add-EsxSoftwarePackage -ImageProfile "ESXi-6.0.0-20150404001-NUC" -SoftwarePackage "sata-xahci"
Thanks four your great Tuts. i tried to create my own image with the ESXi Customiser and it did not work, because there was an exception thrown, that it does only work with Version 4.X or 5.X. The Performance on my Nuc i5 is pretty poor. Every access to my storage is VERY VERY slow. Is this a NUC-Driver problem or a ESXi 6 problem? Which NUC do you have problems with, and is the storage SSD, or HDD? I haven'd done a performance test yet but performance is okay. What kind of drive is it? It's a Raidsonic Case with two 320GB 2,5" Disks linked up via SATA. There is a Oxford Raid1 Chip inside. This Case doesn't need any driver and is recognised as normal 2,5" HDD in ESXi. Any news on PCI/GPU passthrough for 4th gen i5 NUC? Did not get this working with previous versions but would make for a brilliant machine if it did. Hi, Its a great tut. I`f got it running, Thanks for that. I`m in the last step of building my home-lab (for a Cisco course). Connecting via serial (telnet://x.x.x.x:9001) to one of the VMs. I noticed that with the current license that is not possible, it has been blocked. Is there a other way to connect to the Cisco Lab to the console. I`f been looking around but nothing that could help me connecting to one of the VMs. I hope someone can help me or have the same problem. Excellent tutorial, worked for me. I have a question about the Wi-Fi NIC, ESXi 6 does not see it in my build, is there any way to get the VM's to have access to the Wi-Fi? Quick question: in 5.5 we needed to add the e1000e drivers to the package, I notice in 6.0 there is no need to do that? Can you please confirm that we don't need to. P.S. I'm using the NUC5i7RYH. Yes, you don't need the package. The driver (and the correct PCI ID to driver mapping) is included in the ESXi 6.0 base image. I was able to get ESXi 6.0 installed, although when I try and add the host to vCenter it fails. I deployed a vCenter Appliance onto the host... I'm going to set up a small cluster with NFS shared storage on some nuc5i5ryh boxes. Were you able to get them connected to vCenter? Oh the vCenter error says the parser fails on invalid vendor string... so yeah. There is a solution for that. See this post. On NUC5i5MYHE, BIOS v0024 fixes this problem. But it also breaks VT-d, ESXi hangs on boot at "Initializing IOV ..."
To bypass, either disable VT-d in BIOS or apply ESXi boot parameter noIOMMU. Or, downgrade BIOS back to v0022. Someone has ESXi ISO image 6.0.0b Build 2809209 ? You can create an ESXi 6.0 Image with Build Number 2809209 by using the latest Image Profile "ESXi-6.0.0-20150704001-standard". Just edit the Image Profile in the "-CloneProfile" Line. The strange thing is that esx was installed on usb key instead internal ssd ! Has anybody had an issue with connecting to your ESXi Sever via VMWare Fusion? I build the ESXi install with both the HDD and NIC drivers on windows using the powershell script. I just get a "Loading" message when trying to connect. I was able to connect to my 4th Gen i5 running ESXi 6.0 on the same network and machine. Would anybody know of an issue with installation/drivers that would prevent my VMWare Fusion from connecting to the server to manage VM's and view Memory and CPU Using? Am trying to get ESXi 6 working on the 5th Generation Celeron NUC5CPYH. CPU is a Celeron N3050 and NIC is a realtek 8169 (or 8168?). I've tried adding the net55-r8168 and net51-r8169 offline bundles, adding ignoreHeadless=TRUE to the boot options, and various sizes for the IGP graphics memory in BIOS, enable & disable ACPI in BIOS, flashed latest BIOS, but it always hangs at "Relocating Modules and starting up the kernel"
Has anyone managed to get ESXi (any version) working on NUC5CPYH or NUC5PPYH ? Same issue here. It would be a great machine for esxi. Hope that sameone has succes on this type and let us know it. I hope it will be possible in the near future. I will keep trying also, and will inform if I find a solution. Any luck with this? anyone? @fgrehl? SUCCESS with the Celeron NUC5CPYH & ESXi 5.5U3a & ESXi 6.0U1a !!! Created ISO using "Create ISO with ESXi-Customizer (v-front.de)" method above, to include the net55 driver for the Realtek NIC. Then used VMware workstation to install the ISO onto a USB flash drive. Updated NUC BIOS Firmware to latest version 0047. Loaded BIOS defaults after updating BIOS. The trick is that when it looks like its frozen during startup and says "Relocating Modules and starting up the kernel" it is actually still booting correctly in the background but the ESXi direct console user interface (DCUI)is not displayed on the monitor. I think this is a display card issue that when ESXi starts the kernel & switches display resolution/frequency, the NUC display hardware refuses to display it. If ethernet cable is connected and you have a DHCP server available, it will obtain a DHCP IP, and you'll be able to connect vSphere Client to it. Now I can see the local SATA drive, and NIC, and I have a working ESXi 6.0U1a host!! Have NUC5PPYH booted custom ISO with net55-r8168 & sata drivers. Error message: "Relocating Modules and starting up te kernel". Network is up and has address from DHCP (can ping from other systems). Trying to connect to it using vSphere Client, but getting errors only. Any suggestions please? Matt, any chance you could upload your .iso file somewhere? The install just stops at "“Relocating Modules and starting up the kernel” - nothing happens from there, any suggestions? I tried it in a different way, it's a bit easyer to do. Next, use Rufus (https://rufus.akeo.ie/) to save the just created Custom Build ESXI ISO to the USB Disk. Now we make the ks.cfg, make a new text file called ks.cfg and add the following. Save it on the root of the USB Drive. Then, this is VERY important, the disk in the NUC must be completely empty! no partitions at all! Now insert the USB Drive in the NUC and boot from it, as soon as you see the ESXi Installer screen hit the "SHIFT+O"
you should now see a prompt "runweasel"
Add this, "ks=usb:/ks.cfg" (without the ""). So it should look like this "runweasel ks=usb:/ks.cfg"
Now hit the Enter on your keyboard and leave it running for like 10 minutes or so. It might look it's stuck again at the Relocating Modules and starting up the kernel, but it is NOT, it is using the ks.cfg as a install-script. After a while the NUC will reboot, and you have a working ESXi Server, you only have to find out it's IP Address and you can connect to it using your VMware vSphere Client with username "root" and password "mypassword"
Is this in german? Will it accept this? Just wanted to confirm. Crap.. The Google Chrome translation translated when i didn't need it... sorry.. Followed exactly as you have mentioned but it's just getting stuck at "Relocating Modules and starting up the kernel". It's not rebooting or getting any mac from the DHCP server. Moreover I don't see any HDD or USB activity, if any data transfer happens between the usb and NUC I will be able to see USB light blinking, but that is not happening in this case. Any other idea? I have removed all the partitions from hard disk. Did you try this on the NUC hardware or on VMware workstation? I am trying to install this one more time and will keep it running till tomorrow morning. If I don't get an IP address for the NUC, I will consider that it didn't work. I tried this on a actual NUC5CPYH, and it worked right away after I removed the partitions on my SSD. I tried installing esxi on my laptop using ks.cfg but I am seeing the following error/warning messages and then the installation fails. I believe we need to revise that ks.cfg, it's not interpreted properly. I figured out what the problem is, apparently the forum software here changes -- (2 dashes) to 1 large dash. I've put the ks.cfg from my working USB stick on pastebin. Thanks Mark, I will test this when I reach home and will let you know. Sorry I am currently out of state and couldn’t test it, I will update the status on Monday as I will be back home by then. I tried with the new KS script but still no luck. I don't see any hard disk or USB activity after Relocating modules message. It doesn't restart even after waiting for a while. More over I have statically (sticky) assigned ip (via DHCP) for the NUC mac address but no luck. I am using a SATA hard disk. Do we need to make any changes in the BIOS setting? Is there a way to see the console messages? Can you share your ISO image so that I can try with that aswell? Thanks for this! Just picked up a NUC5CPYH to start my small test lab, I'll be running through all this tomorrow hopefully. Thanks Mark and James, I moved out from installing ESXI as things were getting too much complicated and testing is not reaching anywhere. So I finally managed to install Proxmox (an opensource alternative) on my NUC and installation was so easy. Moreover there is no need to patch drivers as it's based on the latest Debian release and almost all the drivers comes pre installed. Managing the VMs are also now easy as we don't need any separate client for host management. Wish you all good luck in virtualizing your NUC. Bobby advice was the best for me, after several long hours i waste trying to install ESXI, in my Celeron NUC5CPYH, i tried Proxmox and it worked! (i had a hiccup re doing the usb as DD and restoring the bios to default EFI) without any major issues. ill stay with proxmox ! Mark's method worked for me. Thanks!! the same problems. you fixed your esxi whith NUC celeron? I success with ESXi 6.0u1b on Celeron NUC5CPYH. Create iso image with net55-r8168-8.039.01-napi-offline_bundle.zip and sata-xahci-1.34-1-offline_bundle.zip (this bundle includes 8086:22a3) by ESXi-Customizer. And flash iso image to a USB flash drive, put the following text saved as ks.cfg in the root directory of the same USB flash drive. Boot ESXi from the USB flash drive, and press Shift+O during startup. Append the following boot option and press Enter. “Relocating Modules and starting up kernel”is still shown, but install is continued (Check HDD access lamp). When install finish, reboot automatically. Wait to complete reboot, and connect by vSphere client to the IP address by DHCP with the following account. My ks.cfg is not shown correctly. Please see the following. You put me the iso correct on any place for download please? please my email is bart@tsis.es, it posible share with my your correct ISO for nuc celeron please, my idea its run on SDCAR. Tried this but not installing, still getting stuck at “Relocating Modules and starting up kernel” and nothing happens. Hard disk light doesnt lit up, think it's idle. I tried with 2nd method mentioned in this "how to" by creating ISO's twice (to add the VIBs). I am on the latest UEFI BIOS firmware. LAN is not getting any IP address from DHCP server. Any help? Can you share your ISO somewhere? Thanks in advance. I managed to get it installed to the local disk, but it's still stuck at "Relocating modules and starting up the kernel.." during boot up. I don't see it getting IP from DHCP either, any ideas what else to try? I managed to get it working on the NUC5CPYH!! 2) Boot the USB stick on another machine (I booted it on a VM) so that it doesn't get stuck on the "Relocating modules"
Glad that you got it working, but how can you move the installation the hard disk after installing it on USB? Since this was taking up time and nothing goes in the right direction I was thinking about installing Proxmox (opensource vmware alternative). Please let me know if you manage to install that on hard disk. By the by I am having a 5PPYH NUC. Just bought a NUC5i3RYH with a 120 GB Samsung SSD 850 Evo M.2. I've installed ESXi 6.0 following the steps (installed it from a USB into another USB drive). Created a customized ISO with customizer, adding sata-xahci-1.10-1.x86_64.vib. When it boots the installer, I can see the M.2 drive listed and I'm asked where I want to install it. After I select to install on the USB drive, it installs and I can boot it. After connecting with vSphere I cannot see the M.2 drive under Configuration > Storage. P.S: I've seen "Temporarily disable AHCI in the BIOS" before installing ESXi, in some other site. I'changed the mode from AHCI to RAID, is it what is needed? Reinstalled everything, and I can see it now. I've create the files as per the instructions...how do I use them to install esxi 6.0 on my NUC? Are the ISO and ZIP files the same thing or do I need both for the install? On the VMware site version 6.0U1A is available, is that going to work? Hope to hear from you, great tutorial! I had my NUC up and running and all my VMs migrated over to this in less than 2 hours. I plan to install ESXi 6.0U1A on my NUC5i5RYH. I've downloaded the trial image VMware-VMvisor-Installer-6.0.0.update01-3029758.x86_64.iso. I wonder what the trial mode do ? Will my ESXi still working after the 60 days of trial period ? Is there a way to remove this trial period ? Thank you for the quick answer, I figure out where to find the license key (with a special URL). I don't why it didn't appears before. I made the custom ISO and burn it (using dd command) to an USB key. On the NUC I tried to boot on this USB Key but it didn't work. The NUC try to boot from network. When I mount the USB drive, i find the boot file (/EFI/BOOT/BOOTX64.EFI). Is there anything special to do on the NUC to boot to the key ? I am getting a pink screen with error "could not mount /dev/"
Do you get this message during installation? If yes there should be a better error message in logfiles. Press Alt-F1, login with root (no password) and check the log (/var/log/vmkernel.log for example). I made custom ESXi 6.0u1 iso whih sata-xahci.zip included. I can install it in VM Ware fusion and run it from USB stick on my NUC without any issue. But when I burn the iso on my usb stick (using dd if=..iso of=/dev/disk bs=1m) and tried to boot from it (with EFI boot enabled or disabled) but it doesn't work at all. Seem's like the usb key is not bootable. I am on a Mac but I'm to going to try with Rufus on a Windows VM. Depends on what you want to do with your NUC. I am always installing ESXi to an USB stick. This allows me to quickly change versions (multiple sticks) or play around with products like Pernixdata or VSAN. When you want to use it as home server only its OK to install it to the SSD (it uses the remaining capacity as VMFS datastore). When you want to test stuff I think the USB flash drive installation is better. I tried with rufus and it works, it seems that the ISO contain an old menu.c32. Thank you again. Can you change ESXi version and keep datastore and VM ? Moreover need the usb stick to have good write speed (sandisk extreme) ? Or a basic 16GB stick with 10MB/s at write and 80MB/s at read is enough ? Datastores and VMs are persistent when you change ESXi versions. This applies to both, when you Update/Downgrade an ESXi, or when you reinstall it (Or change the USB drive where it is installed to). The only exception is when you have a newer VM Hardware version than your ESXi supports (Eg. you create a VM with Virtual HW 11. This VM can only run with ESXi 6.0). A basic USB stick is enough. (I'm also using crappy old 4GB sticks. - Homelab use only of course, not in production) ESXi runs completely in memory (The hypervisor size is only ~300 MB). According to speed, the only affected part is when the ESXi boots, but you won't notice a large difference there. Thanks for all your explanations. I choose using a USB stick for ESXI installation. This works like a charm. I have a last question concerning plugging an USB drive to a guest OS (debian 8). When I want to add an USB controller I add a weird warning : "This controller is not supported for this guest operating system". But when I connect the USB device, everything works (maybe not at full speed, I write nearly at 30MiB/s). What is the best way to add an external USB 3.0 drive connected to a guest OS ? Add-EsxSoftwarePackage -ImageProfile "ESXi-6.0.0-20150404001-NUC" -SoftwarePackage "net-e1000e"
Add-EsxSoftwarePackage -ImageProfile "ESXi-6.0.0-20150404001-NUC" -SoftwarePackage "net-igb"
But with the same result. What can I do? having the NUC5i3RYH and tried to install ESXi 6.0. But it hangs on "No Network Adapters". I tried to load the net-e1000e but no chance. My NUC has the latest firmware 3.50. Great tutorial, building the ISO with this information was a breeze. Am planning to get a NUC6i5 when it releases, to replace an older router/firewall (watchguard) by virtualised pfsense. Been playing with a NIC5i3 in the mean time. I would love it if it could also replace the HTPC at the same time, from what I've read it should be possible, but I haven't found much information on the topic, I don't think it's something that will work out of the box. At the bottom of this screen it states "The device is running in passthrough mode". But I have no idea how I can assign this to a VM. What happens now is when the PCI devices (audio and/or video) are connected to the VM (Win 8/10 x64 client) is that the ESXi installation on the NUC (currently 5i3RYH) freezes completely and requires a hard shutdown. Great tutorial. This worked really well for me. The only issue I have is that I can no longer access the bios on the nuc. Is this normal after installing ESXi ? I don't have a need to go in there right now, but worries me not having the option. Thoughts? Thinking in implementing NUC5i7RYH as ESXi for small companies, anyone recommending this for a production environments(non-lab)? Is it possible to install ESXi 6.0.x Intel Nuc NUC5PPYH you just purchased? I don't have a NUC5PPYH to test it. What error message do you get? "Relocating modules and starting up kernel"
How do we get VMware-ESXi-6.0.0-2494585-depot.zip? I cannot download it without giving VMWare $$$? Is there a way to do this for free? I am running ESXi 6.0 on a NUC. It has been running very well except that I have noticed that the fan keeps cycling every 60 seconds. It will run for about 5-10 seconds, then either turn off or idle down, then 60 seconds later it cycles to high speed. I have checked, it does not look like a temperature issue. I am currently running only 4 VM's, 3 CentOS servers and one Linux workstation. Method number 2 worked for me. Luckily the ESXi-Customizer is still available. It is unsupported and tells you to use the Power-Cli tool instead. It did however work. I could not get the Power-Cli tool to work, it would not take the "Add-EsxSoftwareDepot" command. Probably something missing on my end when I installed powershell3 or something. I am running the NUC NUC5i7RYH, and was able to get the esx installer to see the Sata drive, flash drive, and USB. I used the latest package from the Eval Download page. I've installed Esx 6 on my NUC5i7RYH without problem following this guide ! Today after 4 month working fine, causing unexpeted reboot i've this message on screen "No compatible network adapter found. Please... etc etc"
I was able to install everything without any problem. However, on a Windows X VM, the maximum screen resolution is 1280x800. Do you know how can I fix this issue? What is the power consumption of the NUC5PPYH with ESX 6? Or does this break the AHCI customization? Hi what's tour advice to install ESXI 6 on a 3rd gen i3 (Nuc3217iye) ? What drivers packages ? 94585-NUC'. You may want to use the Get-EsxImageProfile cmdlet to search for an image profile. The error message states that you are using a non existing image profile. Has anybody got 6.5 to run on NUC 4th gen?